UPDATE: Another photo of Bessie. 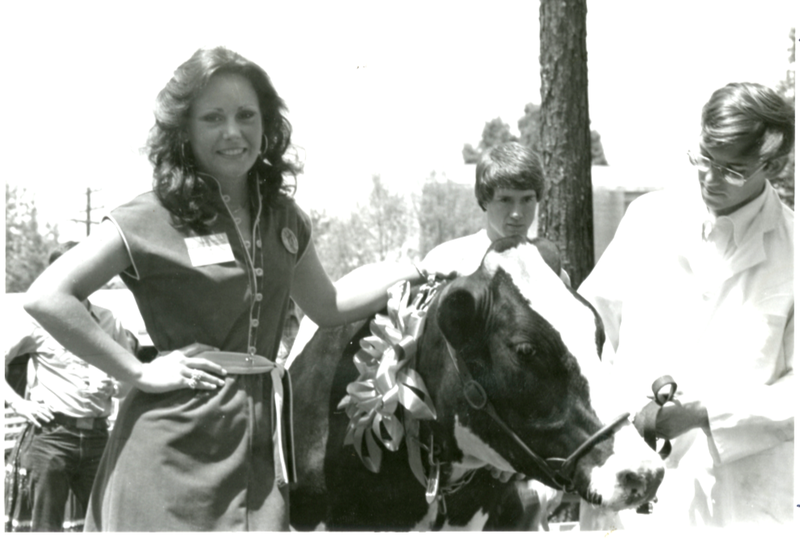 Mooooove over, Miss Auburn: Cindy Murphy and Bessie the Cow. 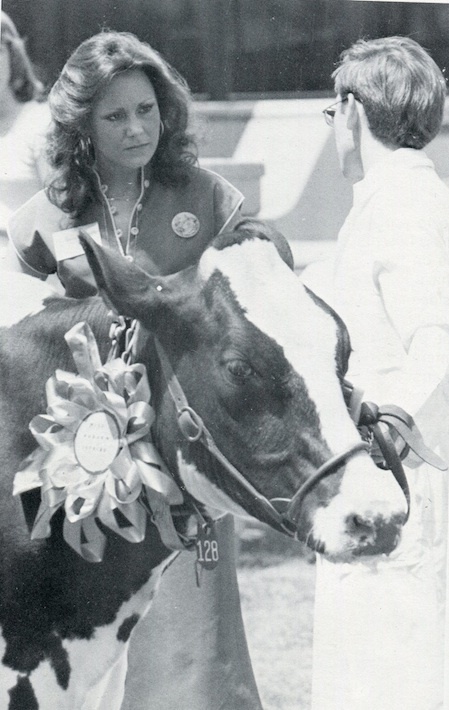 One year, Miss Auburn was a real heifer–a prize-winning Holstein to be exact. Running on a “Legalize Grass” platform, Bessie the Cow—the Auburn Vet School knew her as No. 18, but her real name was Amelia—not only ran but won the 1979 Miss Auburn election. It was a joke. But there were slogans (“Not Just Another Drop In The Bucket,” “Bessie—She Won’t Steer You Wrong”), there were handouts, there were posters, there were orange T-shirts. And there was national attention. Block and Bridle, a student agricultural organization, block-voted for Bessie. A huge pro-bovine banner was strung across the front of Mag Dorm. But Greeks also got behind Bessie, at least some of them. Phi Kappa Tau painted “BESSIE” in large letters across the front windows of the fraternity house and wound up doing the block vote thing, too. 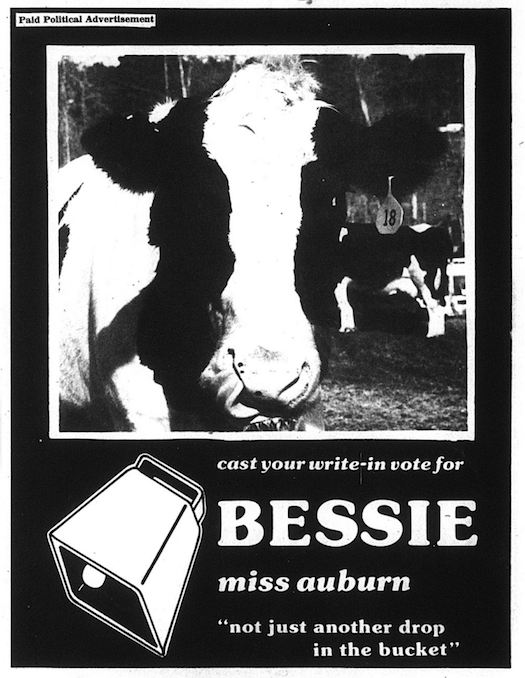 And according to the 1980 Glomerata, Bessie—who “liked Auburn because the people were so friendly and had warm hands”—was actually billed as a member of Mu Omega Omega (MOO) sorority and the captain of the the sorority intramural pasture muffing throw team, as well an active member of the SGA and a Barn House Sweetheart. And she did, with a total of 2,385 votes—1,376 more (it was the greatest margin of victory ever) than Cindy Murphy, her closest competitor. They were all write-in. They were all illegal. And at least to some people—mostly members of other candidates’ campaign teams forced to fight a cow for publicity—they were an affront to the Miss Auburn process and an insult to Auburn’s image. Butgereit thought that was udderly ridiculous. 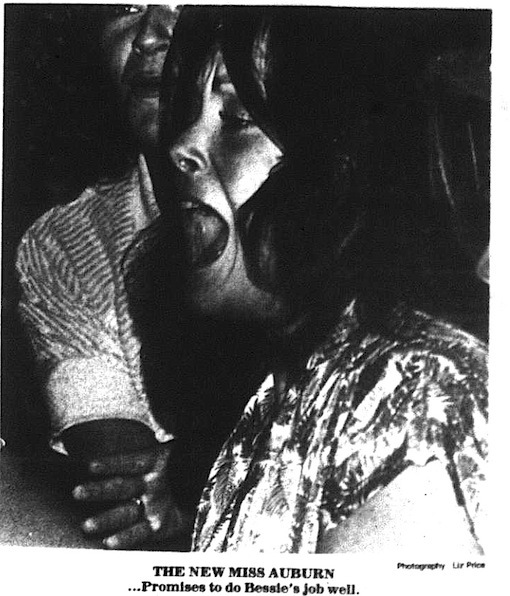 Cindy Murphy reacts to winning a cow-less runoff. Save mild criticism that Bessie may have kept votes from more deserving, human candidates, Cindy Murphy, who was named the legitimate Miss Auburn after winning a run-off election by just 74 votes, was totally cool with it. Bessie photos: 1980 Glomerata; Poster: @SuiteAuburn; bottom photo: The Plainsman. Related: Former Miss Auburn trying to become Nashville’s first woman mayor. If you’d like to help TWER keep the lights on and the obsession with Auburn lore unhealthy, you totally buy some good, cheap Auburn stickers. They’re great. Ah, my freshman year. I so remember this! Cindy was a good sport about it all, too. My kids never believed me when I told them about this. I was at Auburn at the time of this homecoming election. Paul Harvey, the national radio commentator even did a story on Betsy the Homecoming Queen. I seem to remember Betsy was at the homecoming presentation, but had to stay off on the side-lines. I was a junior who proudly voted for Miss Bessie. The whole thing was a lot of fun and like auburntygr, my main memory is the grace and good humor with which Cindy Murphy handled the situation. Auburn was blessed with two wonderful Miss Auburns that year! Um, sure. Light-heartedness aside: I still think I could live comfortably in a world where this didn’t happen. Freshman year for me too. Auburn has always had a better sense of humor than any other school in the state. I remember this well. Some of the Greeks who supported traditional candidates did not like it at all. But the vast majority, including Cindy Murphy, took it in the spirit in which it was intended. Good memories. Yes, I also voted for Bessie. Senior in 79, voted for Bessie! I still have one of the Flyers that were put up around campus! Different from those shown here but very effective! So is this why some call Auburn a “cow college” ?